It was the Ancient Greeks who first studied rhetoric, the art of persuasion. They identified what became known as the 3 pillars of persuasion; Ethos; Pathos and Logos. Their proposal was that you couldn’t be a successful persuader without all 3. This refers your credibility when you are the person doing the persuading. It involves being trusted by the people you are trying to persuade. That could be influenced by your track-record, your academic qualifications or simply your job role, whatever it is that gives you credibility with the group of people you are persuading right now. It might be a different thing with another group, so it’s important to think up front about what it might be for you. This is all about emotion. Theirs and yours. First you need to know what they care about. What gets them excited and what keeps them awake at night? Present your case using either what you have to excite them with or what you have to take away their fears and you have a much more receptive audience. Then there are your emotions. If you don’t present your case passionately you have zero chance of getting your audience to feel passionate about it. It’s only worth working with Logos (logic to you and me) if you have both Ethos and Pathos. Frankly if you seem untrustworthy to me and you are talking about things that don’t excite or scare me I’m not even going to listen to your logic. However if you do have the Ethos and pathos then your logic had better add up. You’d better have some evidence or statistics from reliable sources (providing more Ethos) if you really want to persuade me. So, when you are persuading, whether it’s in a presentation or 1-2-1, get your Ethos, Pathos and Logos sorted out before you start. 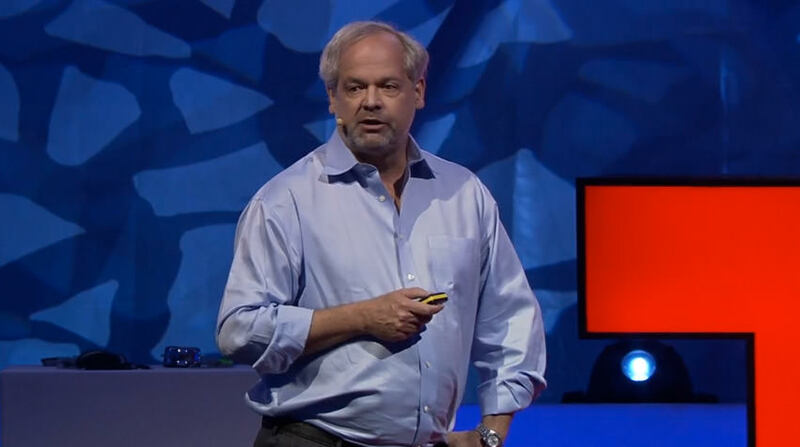 Juan Enriquez uses a simple metaphor to describe a complex scientific point. Watch the video to see how he does it and learn to do it for your own presentations. Metaphors and similes are a useful way to get a complex message across to a non-technical audience. Finding the right metaphor for your complex concept can be tricky, but once you’ve found it you can use it again and again. Incidentally, in this video you can see the way that sometimes an understated performance, and very simple language can point up a serious message. When he talks about scientists making an exact replica of a mouse using manufactured stem cells he sums it up by saying “That’s a big deal.” and holding a long pause whilst the importance of the achievement is realised by the audience. This video is an excerpt from a longer presentation made my Enriquez at the TED conference in Doha in 2012. If, like me, you become fascinated just from this clip, then you can find the whole presentation at TED.com along with hundreds of other inspiring videos. 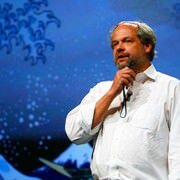 Learn how to hone your presentation techniques like Juan Enriquez. 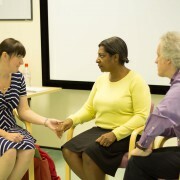 See our range of presentation skills courses for more information. When people are asked to prepare a presentation the majority of people start by using PowerPoint (or Keynote if they’re a Mac user). It’s the tool that’s designed to help with presentations, right? Er… yes, PowerPoint can help with presentations, but using it as the basis to prepare a presentation is a recipe for disaster. Ditch the PowerPoint until much later in the process. Devising your presentation using PowerPoint leads you to build it a slide at a time. Maybe even a bullet point at a time if you are unwise enough to use a bullet point slide template. That means you are trying to build up a compelling argument one point at a time, hoping that all the little points add up to something big. Like a novelist who starts off writing the first page without thinking about what the whole story is about, you will be very lucky if you succeed. Instead of starting with the detail you will get much better results by starting with the big message. If you could boil down the main message your presentation into a single sentence, what would that sentence be? “Our product best suits your needs”? “My idea will make your life much simpler”? “My policy will lead to a better future”? Write that sentence down. Next think about what are the big things you need to persuade the audience about to get them to agree with that sentence. Let’s take the first one as an example. You have correctly identified their most pressing needs and the biggest problems they need to solve. Products in this area can do most of those things, but not all. Your product can do all of these things because it’s got factor x and that’s why it’s the best one for them. Now you’ve got a coherent overall structure for your presentation and you can start to look at each section to see what supporting points you need to make. When you’ve done all that, you can start to think about using PowerPoint to enhance your message with images and diagrams to explain the complex stuff. We’ve created a handy “Quick Content Organiser” which will help you structure your presentations. Form more information, see our presentation skills courses and coaching opportunities. The best PowerPoint tip ever! Love it or hate it PowerPoint is the most used software for producing slides for presentations on the planet. For my money this is the best tip you can get for successfully presenting with PowerPoint. When you reveal a slide to the audience they will read it all the way through and keep on staring at it long after they’ve done so. That’s assuming it’s a text slide. If you, like me, prefer to put an image or a diagram on your slides then they will still just stare at it the whole time it’s on show. Consequently you just become the voice-over artist to the slide. It robs you of all the personal impact you can make with body language and lets the audience day dream. Only have the slide on display for as long as you need it to be there helping you. As soon as it’s not useful any more, get rid of it. How? Well, hit the “B” key on the keyboard and the screen goes black. (It works in Keynote on Macs too.) Hit any key when you want the slide to come back on again. By the way, if you hit the “W” key the screen goes white. If you use one of those hand-held slide changers, and I thoroughly recommend them, one of the buttons on the slide changer will have the same effect. Check out which one before you start your presentation, or better still use your own slide changer. So remember. Only display the slide whilst it is being useful to you. As soon as it’s not, hit button “B” and become the focus of attention yourself. Become a pro at presenting – see our presentation skills courses and coaching opportunities. https://www.dramaticsolutions.co.uk/wp-content/uploads/2014/05/dramatic-solutions-logo.gif 0 0 Dramatic Solutions https://www.dramaticsolutions.co.uk/wp-content/uploads/2014/05/dramatic-solutions-logo.gif Dramatic Solutions2013-05-01 19:47:572014-06-27 09:37:14The best PowerPoint tip ever! 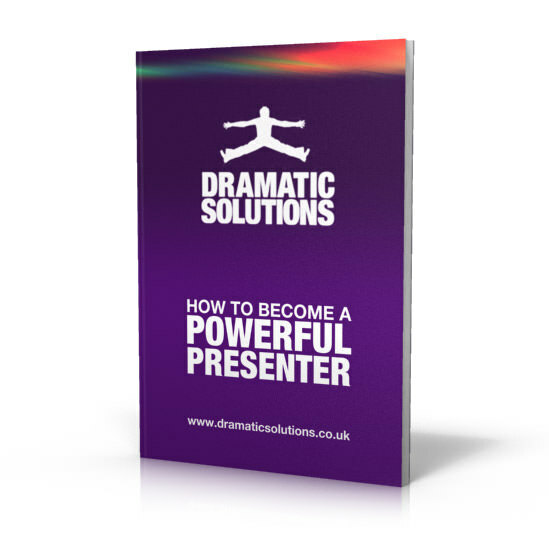 Becoming a powerful presenter is essential if you want to get ahead in business. Yet so many of us have no presentation skills training. We just wing it and hope for the best. In this complimentary eBook (only available to subscribers) we share some of our insider knowledge on how to become a powerful presenter. After all, who better than trained actors to show you how to reach your full presenting potential? Subscribe to our newsletter to receive your free copy of the eBook. “Tell them what you are going to tell them, tell them, and then tell them what you’ve told them”. It may be an old saying, but it is still sound advice. In the introduction of your presentation you are doing the “Tell them what you are going to tell them” bit. The introduction of a presentation is vitally important. It is the point at which people will either tune in to your presentation or decide that it’s not worth listening to, and tune out. Consequently it’s important to get it right. • Arousing the interest of the audience – hooking their interest early by telling them how they will benefit by watching and listening. • Establishing your credibility as a speaker on the subject. • Setting the tone and ground rules of the presentation. • Describing the structure of what is about to come. Each of these functions is discussed in more detail in the video. For more information, view our Presentation Skills Training page. The Rule of 3 is one device that is used in rhetoric – the art of using language persuasively. It’s been around for a long time – the ancient Greek Pholosopher Aristotle wrote the first known book about it – but it is still used today by the best speech and presentation writers. Ethos (in the context of rhetoric) refers to the credibility that the presenter builds for themselves and their case based on such things as establishing their expertise, knowledge and reputation. Pathos refers the the appeal to the audience’s emotions and imaginantion that the presenter makes. It is designed not just to appeal to the emotions, but to draw the audience round to the presenter’s way of thinking. Logos refers to the use of language to make a reasoned or logical argument coming from a factual rather than emotional base. There are many rhetorical devices, such as the Rule of 3 discussed in the video clip. Other examples are: Metaphor, Alliteration, Repetition, Patterning, Hyperbole etc. etc. Many of them can be employed very simply. Dramatic Solutions builds in the quick and easy use of rhetorical devices to our Presentation Skills courses so that you can benefit from them and make your presentations more persuasive. If you’d like to find out more ways of making your message memorable, book a presentation skills training course or coaching session from Dramatic Solutions. Find out more about these Here. The appearance of confidence has a direct relationship with how much space we take up. When we are nervous we make ourselves small. We do things like standing with our feet close together, sometimes even with ankles touching. We keep our arms close to our sides, which restricts our ability to gesture. When we’re feeling confident the opposite happens. We stand with feet wider apart and our arms are held more loosely, allowing for whole arm gestures. We can even go too far with this by standing with feet too wide apart and holding our arms slightly away from our sides, producing an arrogant looking stance. Finding the mid point is important. View our video to find out how. Download our free Presentation skills e-book here. Want to find out more about looking confident when you are presenting? Take a look at our presentation skills training courses and one-to-one coaching options here. Whatever your thoughts are on the politics and the morals of former US President Bill Clinton, there’s no doubt that he has great presentation skills. 0 minutes 12 seconds – Clinton talks about Obama “putting a floor” under the financial crash. To emphasise the point he uses his hands to show the audience the floor, creating as he does so the image of a safe pair of hands, just what he wants us to think of Obama. He immediately goes on to show us the “long hard road to recovery” by using his hands as a frame through which to view that road. He then uses a series of hand gestures to add emphasis to the points he makes about what has been done. I’m not usually a fan of pointing gestures, but here Clinton uses them to reinforce his authority, as though he’s saying to us “I know about this, and I’m telling you”. 1minute 0 seconds – He starts to compare Obama’s attempts to create jobs with the Republican Party’s attempts. Notice how, every time he talks about Obama’s actions, he gestures to his left (our right). When he speaks about the Republican Party he gestures to his right (our left), thus clearly physically separating the two and emphasising that they are opposites. This allows him to produce a memorable moment comparing what he refers to as “job scores” with a large gesture on the “Obama side” to emphasise the size of the number he is talking about and then crossing to other side to make the classic zero sign for the Republicans. 1 minute 30 seconds – Clinton is in story telling mode here, imagining a conversation between him and a Republican politician. He uses huge gestures to support his story, with his arms sometimes at full stretch. The size and boldness of the gestures helps to make the points he is making appear clear and simple, which is what he wants. 2 minutes 0 seconds – Clinton wants to make his opponents seem stupid, so he tells the audience that when asked what the Democrats brought to Washington that resulted in a positive budget is something he can tell in one word – “arithmetic”. Because he wants this to appear simple, and therefore anyone who doesn’t get it is stupid, he emphasises the point not just with a simple gesture, one finger held up, but also with a facial expression that suggests contempt for people who don’t understand. 2 minutes 45 seconds – The build up to the big finish starts and as we get towards the climax Clinton goes for repeated pointing gestures to support his message that they must do as he says and vote for Obama. Finally as he says “God Bless America” we get a wide gesture suggesting that he cares about everyone in the country, not just those people in the hall. If you care to analyse it further, there are great rhetorical techniques in the speech to including Rhetorical Questions, Antithesis, Repetition and more, so there’s plenty to learn from this 3 and a half minute clip. Can these skills be taught? You bet! We work with people every week who learn these skills and practice putting them into action on our presentation skills training programmes. We video their practice session, so they can see that they are improving. OK they might not get chance to adress an audience the size of Bill Clinton’s, but what ever audience thay address they know they will make their presentation clearly, confidently and with conviction.